Despite harbouring the lower half of the ranked positions, this next selection are all hearty recommendations. 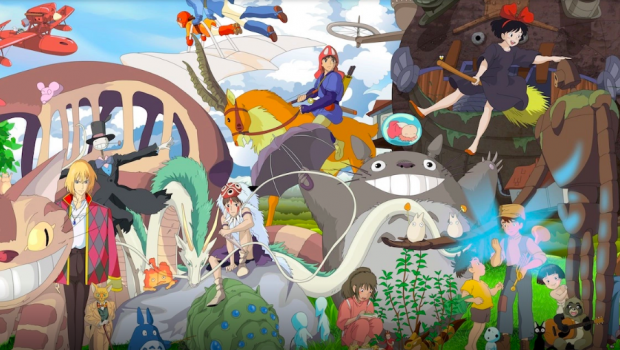 The inclusion of Ghibli’s mascot movie, My Neighbour Totoro, is by no means an insult – but rather an endorsement of the majority of the studio’s offerings. Those readers who scan the ranking and type furiously in the comments about the shocking position of their favourite film must remember how many of Studio Ghibli’s output are superior to the vast quantity of animated junk spewed out of the Hollywood machine. Nevertheless, the reasons that separate these from the higher half are small niggles that refuse to budge when sat comfortably and analysing the collection. They all include moments and sequences that are mesmerising, which whisk you away to another world. 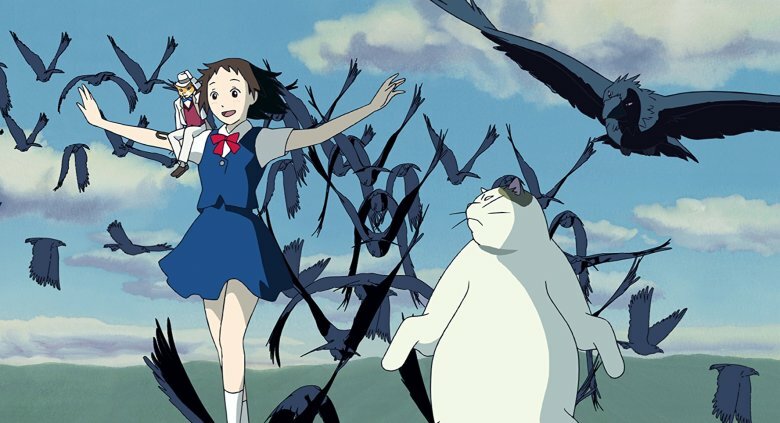 The sixties setting of From Up On Poppy Hill; the mad cat bus in My Neighbour Totoro; the billowing dress of Kiki as she cruises through the sky in Kiki’s Delivery Service. Indeed, many may find their own favourite film in this selection. But, on a closer inspection, there was something lacking. Below, you’ll see me twist and contort my words to explain why I had to position them lower than the rest. A semi-sequel to Whisper of the Heart, The Cat Returns takes the smart, well-dressed Cat kingdom and builds a film around it. Beloved by many, it has a ridiculousness that feline fans would adore – but it all becomes a little too far-fetched and cat-obsessed for anyone who perceives cats as creatures who hold a slightly sinister edge. 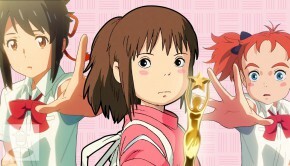 Haru, a young teenage girl, instinctively decides to save a cat from a road accident. To her shock, he politely thanks her and scuttles off. He is Lune, a Prince in the Cat Kingdom. By saving his life, the Cat King expects Haru to marry Lune. With the help of the Baron (the smart feline from Whisper of the Heart) and his big friend, Muta, they travel to the Cat Kingdom to stop the wedding from taking place. But it is a race against time as Haru starts to turn into a cat herself, and Lune is nowhere to be found. The very notion of turning into a cat, with ears sprouting and a tail emerging, is the type of fantasy many would thoroughly enjoy. But it can feel a little random; suddenly we’re in a mini town; now there is a sleazy King cat; now she has to marry a prince. It all becomes lost in the barmy world and therefore lacks the subtlety and depth of the majority of Ghibli’s films. Children [who like cats] might enjoy it but adults may find it wanting. After all, some of us prefer the ever-smiling, always-excitable dog to the sneaky-eyed cat. One of the most recent offerings, When Marnie Was There plays like a dreamy half-memory that captures the innocence of youth within the grand context of family and history. Bathed in deep, calm blues and natural, lush greens, When Marnie Was There is an escape from the hectic, busy films that arguably dominate children’s movies. Lovingly depicting a child with an unconventional family set-up, When Marnie Was There will surely strike a chord with many children. Based on the novel of the same name by Joan G. Robinson, When Marnie Was There introduces Anna, a child within a foster family. After a health scare at school, she is sent to stay with her auntie and uncle in a scenic beachside town in the hope of breathing in fresh air. While there, Anna becomes friends with Marnie, who holds a secret that will impact on her entire life. While creating a soft and inviting environment, When Marnie Was Theresometimes misses the fun and charm of higher-ranking Studio Ghibli. Its supernatural layers are purposefully not playful and the seriousness can weigh down the narrative. Ponyo, Spirited Away and Laputa never become as drawn out and, though it holds many plus points, it misses the urgency, energy and pace of many of Ghibli’s movies. Kiki’s Delivery Service begins with a wonderful, unexplained tradition. Kiki, a 13 year old witch, is due to leave home. Her cynical, funny black cat Jiji tags along and the two set off in the sky. It situates Kiki as someone who is growing up and the future is exciting. In fact, the journey alone, high in the clouds on a broom, is exciting too. It is such a fun beginning and it immediately establishes a world that, in many respects, is the same as ours but with a few mystical differences. The majority of the tale takes place in the Port town of Koriko. 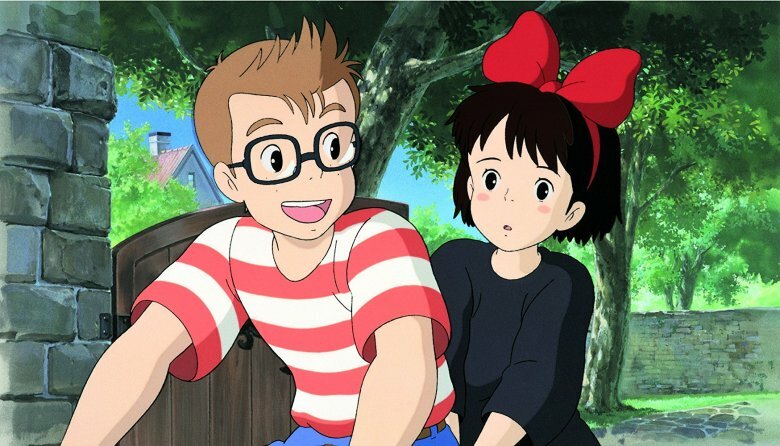 Kiki manages to find a job, accommodation and she seems to gain the affection of the spectacled Tombo. Helping Osono, a pregnant baker, she dreams up a delivery service using her broom-flying skills and begins to get to know the community and make friends. Witches, talking cats and flying broomsticks seem a long way from Studio Ghibli’s type of filmmaking, but Kiki’s Delivery Service manages to include them all to great effect. Miyazaki’s love of aircraft feeds into Kiki’s speedy broom-flying talent and in Tombo’s love of aviation. The romanticised town and likeable characters create a kind-hearted and inviting story. There’s even a small nod to artist Marc Chagall, in a painting by a character. Outside of the witches, Kiki’s Delivery Service doesn’t push the supernatural side and the witches, though considered rare, are very much part of society. But, despite all the lovely elements, the story seems to lack a clear structure with events playing out one after another without a clear, overriding connection. Interestingly, Nausicaa was released before Studio Ghibli was founded. Purists might take it out of the mix but it has always been a part of the Studio Ghibli series when released on DVD and Bluray. In fairness, Nausicaaincludes many features of Miyazaki’s finest films. Considering the film originally dropped in 1984, it feels incredibly ahead of its time. Is the film environmentally aware? Yup. Does it include a sci-fi war of global proportions? Absolutely. Is there a determined, passionate female leader who is spiritually and emotionally aware of how to solve the problems? Without a doubt. Set in the distant future, Nausicaa is the Princess of the Valley of the Wind. She hopes to connect the humans with nature, however destructive it is, in a peaceful manner. In the midst of this strange, uncertain world an enormous ship from a different kingdom crashes down. The cargo ship has arrived from the Tolmekian Kingdom and the soldiers don’t take too kindly to the Valley of the Wind. The stakes are high and Nausicaa needs to not only create peace between man and nature but also between the fighting armies that plague the Valley. 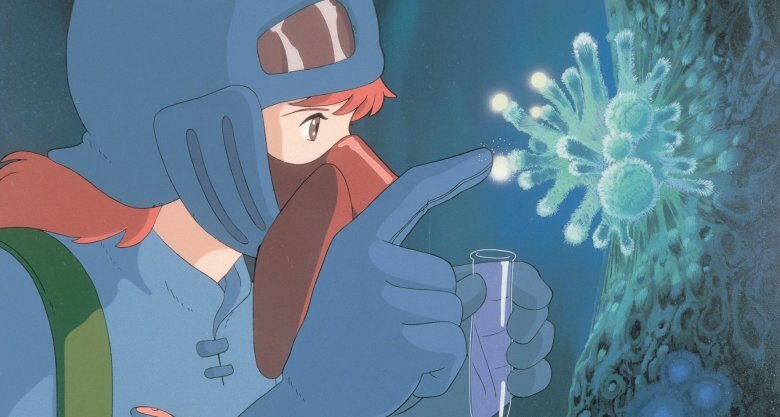 Everything we love about Laputa, Howl’s Moving Castle and Princess Mononoke began in Nausicaa. Unlike many Studio Ghibli films, though the themes are progressive, the style of Nausicaa does feel a little dated. Some may find the synthesised score a charming bonus, but it is clear this is Tahakata and Miyazaki feeling for a focus for the studio. 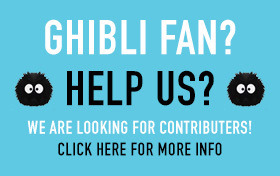 That also means that if you love Ghibli, then it has all the right ingredients but, perhaps, not the perfect balance. 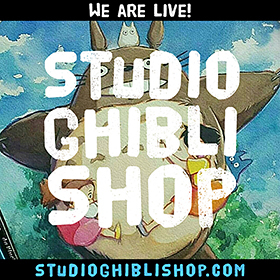 Iconic and unforgettable, My Neighbor Totoro can often be one of the favourites for many Ghibli fans. Unfortunately, my preferences meant that it fell surprisingly low on the list. Remember, very few films are not recommendations, and My Neighbor Totoro is still superior to most animated films. But, sadly, it lacks a clear focus. 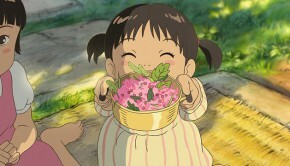 Satsuke and Mei are two girls who move to a house in a rural community. While moving in, the notice a few strange creatures that lurk in the shadows. Cute and intriguing, they follow the spirits and find an enormous, lovable creature: Totoro. 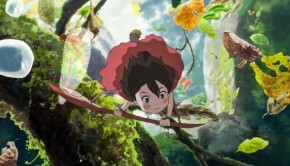 Satsuke and Mei escape to the forest, and play with these creatures, as their father attempts to raise both children while mother is sick in hospital. Their friendship with Totoro and Co is sweet, and resonates in a manner that few cartoon characters do. The story itself is small and personal, and though not necessarily inferior, it does not share the broad scope of Howl’s Moving Castle and Spirited Away. In that respect, it can sometimes seem flippant and forgettable. Not Totoro and the kids, but the encompassing story of change and growing up. Sometimes, it is merely an adventure. Pom Poko, flawed in its busy use of characters, had an adventure too – but it was layered with a pro-environment message that added depth. 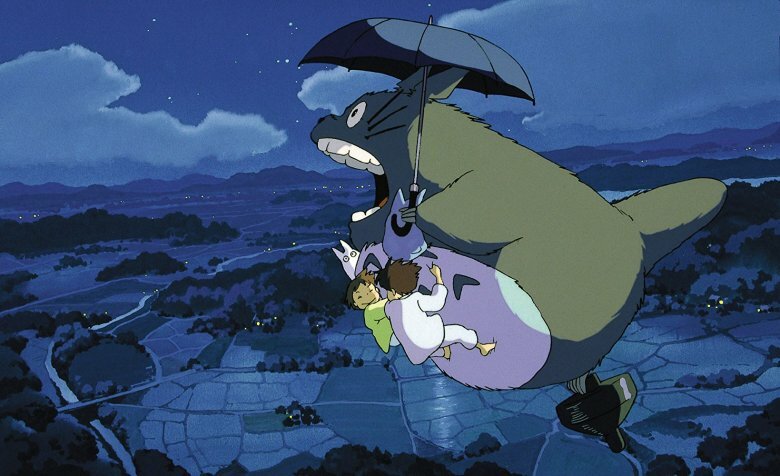 My Neighbor Totoro, for all its charm, offers little other than a bit of disposable fun. Understandably, there is a requirement to justify my position on My Neighbor Totoro, but let us not negate the fun of the film. It may not rank as high as others, but there is an inescapable beauty and innocence to My Neighbor Totoro that few films, even by Miyazaki’s standards, share. Unlike Hayao Miyazaki’s quirky, dreamlike tales, in From Up On Poppy Hill,Gorō Miyazaki has taken on the type of subject matter that Tahakata would be best suited for. 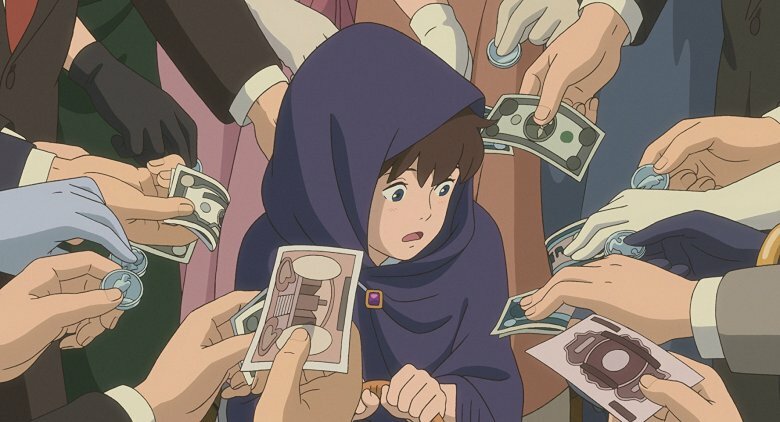 Considering Gorō Miyazaki was in charge of fantasy epic Tales of Earthsea and is the driving force behind Ronja: The Robber’s Daughter, the factual context is unlike anything else he has created – and it is superior to them for it. Set in 1963, From Up On Poppy Hill explores the impact war has on family, and how it breaks them apart. Umi is a 16 year old girl who resides at a boarding school looking over a Port, every morning she raises a flag to tell the sailors “I pray for safe voyages”. This daily action results in a poem appearing in the school paper, written by Shun, a boy who travels by boat to school every day. Both Umi and Shun share a passion for journalism and together they inspire their fellow writers while simultaneously, investigating the past of both their families. Poetically, teenage love is spoiled by the possibility that they are related. Naval photographs and the Korean war hint at the seriousness of the story but, through the eyes of these friends, we see their innocence as they find how war is never limited to the violence: it reaches out and shapes the future. Crucially, it is a warm, intimate tale and includes spectacular animation. It can veer into seriousness too often perhaps, but this is balanced by a story that, though detailed, pays off in the final act. 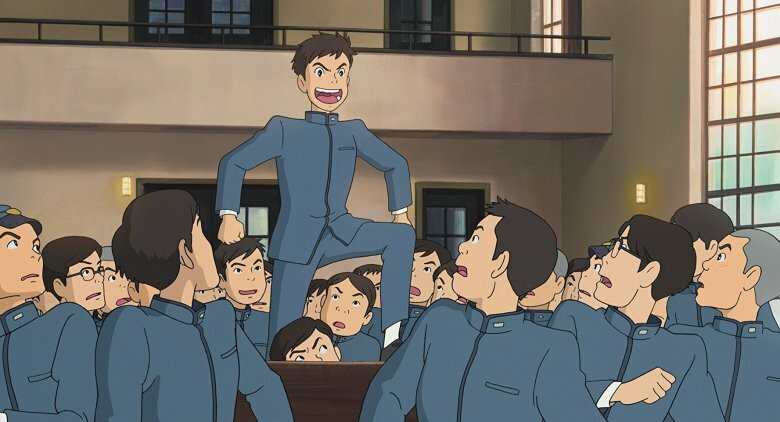 From Up On Poppy Hill is an acquired taste, but it tells us a unique history that is rarely achieved in Western animation. 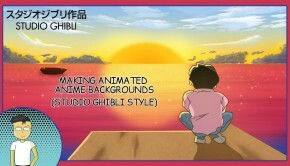 Look out for Pt 3 of our Studio Ghibli retrospective very soon.